← How to convert HTML files to PDF files and combine several PDF files into one PDF file? 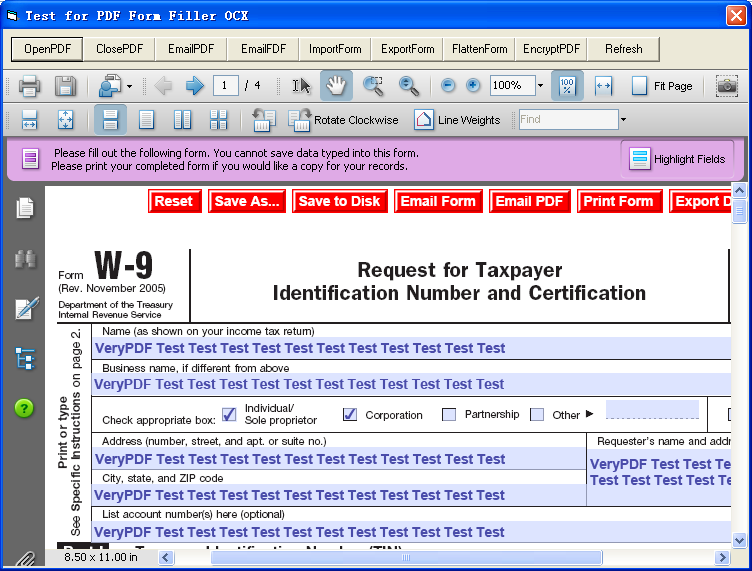 // Merge FDF file into an existing PDF file and generate a new filled PDF file. // Extract FDF file from a filled PDF file. // Encrypt a PDF file. // "Printing Allow ModifyAnnotations Allow ModifyContents"
// "DegradedPrinting Allow ModifyAnnotations Allow ModifyContents"
// "FillIn Allow ModifyAnnotations Allow ModifyContents"
// 0 is an error, other values are valid ID. // returns the maximum number length of output buffer which need to store the form fields, 0 is failed to read form fileds. This entry was posted in PDF Form Filler and tagged fill form, fill PDF form, pdf form filler. Bookmark the permalink.